This crazy Italian family is back and with their new sous chef dropping dead in the restaurant foyer and a big party coming up the story turns into scenes similar to the movie Weekend at Bernie’s . Oh my, this story was hilarious. Add to that a strange group of chefs and their weird rituals, Eve’s community college delinquents and murder investigation and you have a fantastic story. Some of these characters take eclectic to a whole new level. Mrs. Crawford, the pianist that sets the restaurants atmosphere, continues to crack me up again and again. Maria Pia with her nightly Three Coins in the Fountain performances just add to the fun. “You have to give the people what they want.” Eve and Landon try to keep the eatery under control but let’s face it they are fighting an uphill battle. Costa has woven a very creative mystery amongst all the humor. Eve really has the best intentions but she sure gets herself in trouble. She follows those clues wherever they lead and always thinks if she gets caught she can talk her way out of it but that doesn’t always work. 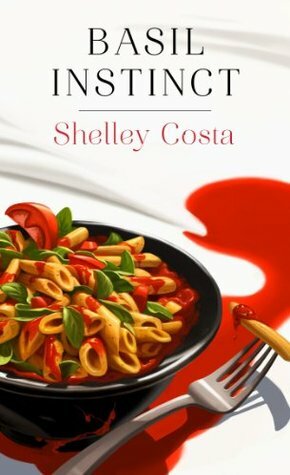 She gets herself into the pesto several times and keeps the reader on their toes. This was a fun read and I was truly craving Italian food when I finished it. Too bad there isn’t a restaurant like Miracolo nearby sans the dead body, of course. Thanks to the people at Pocket Books I have 2 copies to give away! My Review ARC and a paperback copy too! I’m reading this one right now myself. Really enjoying it, too. This is a new to me series. Sounds good! I got an early copy of this. It’s a good read. And, yes, it made me hungry! I read the first book in this series and have been waiting impatiently for this next one to appear on the scene. I’d love to win this book so it can stand next to it’s predecessor on my very Very full bookshelves. Love cooking and cooking shows on TV. Also have been friends with a few people opening successful restaurants. Even more than that , I’m into cozies. Love to sit outside smelling my basil plants and reading this book!! As usual, I have some catching up to do. Haven’t read the first one in this series yet. Italians=great food! Thank you for the review and the give-a-way Dollycas. As always…you done good! Haven’t read this series yet, but a crazy Italian family is right up my alley – and family tree. Great review, I love humor in the stories I read. Sounds like an interesting new series. Loved You cannoli Die Once! I’m ready for Basil instinct? Review – Shadow Catcher by James R. Hannibal Mid-Summer’s Eve Giveaway Hop!